Like to color? 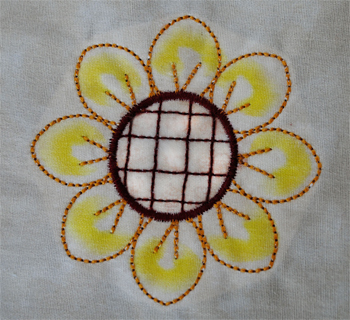 Add a new dimension to traditional embroidery with fabric painting. I first read about fabric painting in an Anita Goodesign newsletter. 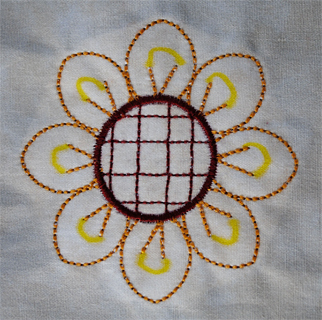 The idea is to stitch an outline design and color it, giving it a watercolor appearance. They used Copic markers and a Copic blending tool which work quite well but are a bit pricy. I wondered about using Sharpie permanent markers and rubbing alcohol as a blending agent and found a later newsletter article which did just that. Further research on the Internet turned up several YouTube videos. 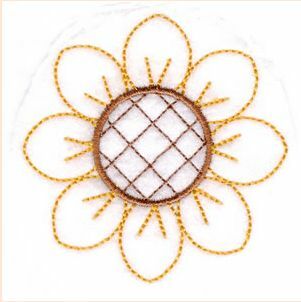 While reading some past blogs, I found one by Pat that described the bean stitch, a triple stitch used primarily as a design outline. When I saw the featured design by Terradonembroidery.com, I knew it would be perfect for embroidery painting. Fortunately, Terri Hanson from Terradon kindly resurrected the design and has added it to her site. 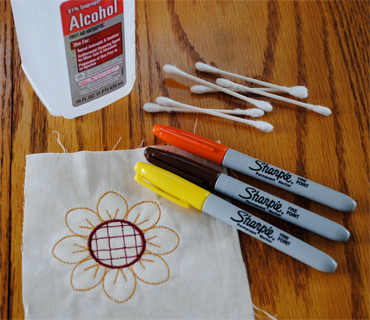 So with some very simple and inexpensive supplies, you can easily create watercolor embroidery. All you need is a stitched outline design, rubbing alcohol, Sharpie fine point permanent markers, and cotton swabs. Be sure to work on a waterproof surface (a garbage bag works well) to prevent damage to your table top. I used an off-white cotton marbled fabric for additional color variation and cotton thread to further emphasize texture in the stitches. Try to stay in the lines. Play around with the markers and alcohol on a scrap of fabric the same as that which you stitched to see how the colors blend. The cotton fabric acts as a wick to the alcohol, so it doesn't take much ink or alcohol to create color within the design. You don't want the color to extend outside the stitch area so err on the side of caution. You can always add color and alcohol but you can not take it away. I added short arches to the inner petals, purposely keeping any added color central on the petal. Then, I dipped a cotton swab in alcohol and pressed it between the "V" at the base of the petals. As the alcohol travels along the fabric, it draws the color along with it and the effects are like a watercolor painting! Press with a hot, dry iron to set the colors. Have fun and don't forget to share your projects in the gallery! This would be wonderful for my grandson, who loves that his mom lets him 'push the green start button' (on her embroidery machine) to start up a piece. He LOVES to 'help' with mom's sewing and I could imagine this being LOTS of fun for Children of People Who Sew! Yes, Neville58, it would be perfect for children (and any of the rest of us who like to color!). I thought it might be a useful tool in some physical or occupational therapy too. That is so cool!!!! I cannot wait to use it. Also, if you are not familiar with Terradon, you will appreciate the site. They are friendly and very helpful. They are like AnnTheGran, great friends. I think of embroidery in the same way as a friend who has stopped by for a little tea and chat. I hope you feel this too! Thanks, Pat. It was so much fun. It also goes to prove that your blogs are timeless and a great reference for Ann the Gran readers.